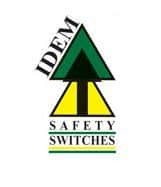 IDEM Safety Switches: Designer and Manufacturer of the Next Generation of Safety Interlock Switches - Allied Automation, Inc.
IDEM’s range of Safety Switches provide YOU with modern cost effective Machine Safety solutions. Their team of designers, with numerous years of expertise in the safety field, continue to design and present new innovative products to the market. As a technology company, their Research and Development efforts are focused on producing the finest products by fostering innovation and ingenuity, whilst maintaining compliance with the latest standards and approvals. Their knowledge and expertise developed over many years has resulted in numerous inventions, providing the ideal solutions for the human-machine environment. Their R&D fields include Mechanical, Electronic, and Sensing technology. Call us at 800-214-0322 for more information about our ITEM products.